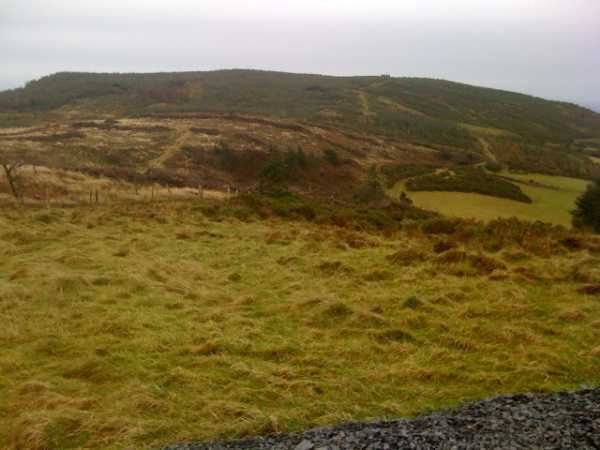 Picture from group : Such an innocent looking hill! Picture: Such an innocent looking hill! 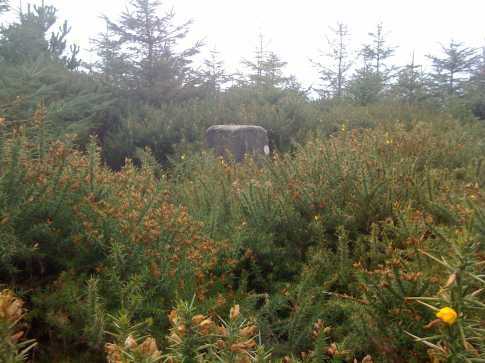 Barranisky is a small hill but it is difficult to reach the summit due to dense gorse and forestry growth. 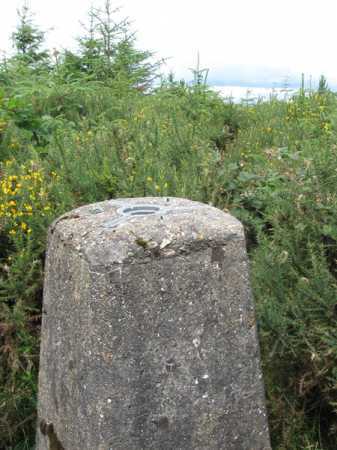 It is advisable to use a GPS to help track down the elusive trig pillar, although a few of us plucky MountainViewers have torn ourselves to shreds to bring the route to you! My plan was to park at the area called Glenteige to the west of the summit, and find a way up. Turning off the main road at T243 790 D to follow the minor road to this area, I was met with a sign which said “No Entry”. Strange, as this was a public road. I followed it past a number of houses until it came to a dead end at a gate at T249 791 E with another sign saying “Private, Keep Out”. I called to a nearby house to ask about parking and access, and was given the useful information that Eircom have an agreed access track from the “Private No Entry” gate up through the farmland to their masts at the summit of Barranisky East, As I couldn’t see another way up without crossing private land I seized upon this nugget and drove up along the track to the summit of Barranisky East, where I parked at a gate at T251 796 F. I was now about 1km NW of the main summit. From the car I chose to follow a direct route SE across felled ground alongside the forest, until I met up with a forest track. From here I then spent a tortuous 2 hours following tracks around the hill first circling to the south, then around to the north and east of the heavily forested Barranisky looking for a way into the dense growth. 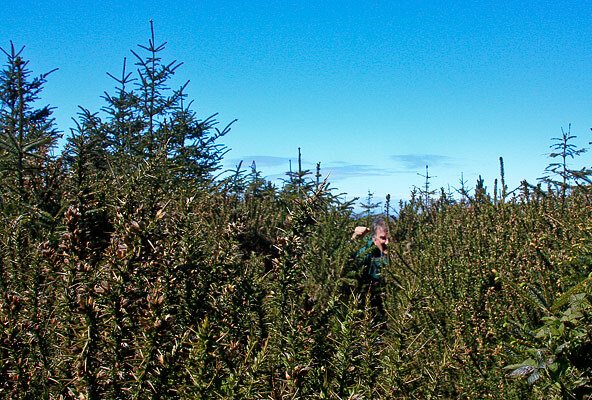 I was within 100 metres of the summit on several occasions but could not find a way into the impossibly thick forestry. After retracing my steps repeatedly I was ready to concede defeat. I was heading back along the track wondering how a 280 metre hill could be explained as inaccessible when I came to a little rough track heading uphill that I had missed previously. This was at T255 793 G near the ruin of an old farmhouse. I’m not sure how I had missed it but as I followed it uphill between the trees I wondered if this could be the elusive route to the top. It ended abruptly in a small clearing with the same dense gorse and tree growth in front of me. However I found a way in and realised that someone or something had previously been through and I battled my way along, following the faint remains of their progress. This required the usual crawling, squeezing and claustrophobic fumbling through the high growth. 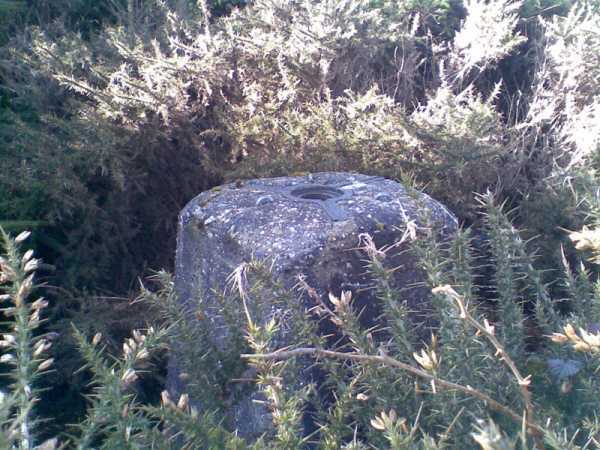 Instinct or luck brought me to a point where I suddenly saw the trig pillar peeping from the gorse at T256 790 C. This is not a hill to be climbed for the views as the trees and gorse come to within feet of the trig pillar. GPS was needed to find the right way back into the growth to return to the track below.